Alexander W. Livingston (1821-1898), a Reynoldsburg, Ohio seedsman, in 1870 developed the first commercially successful variety of tomato. He changed the tomato from an ugly duckling of horticulture (small, ribbed, hard cored, and almost hollow) into the uniform, smooth-skinned, juicy, flavor-packed, meaty beauty that is one of the world’s favorite foods. 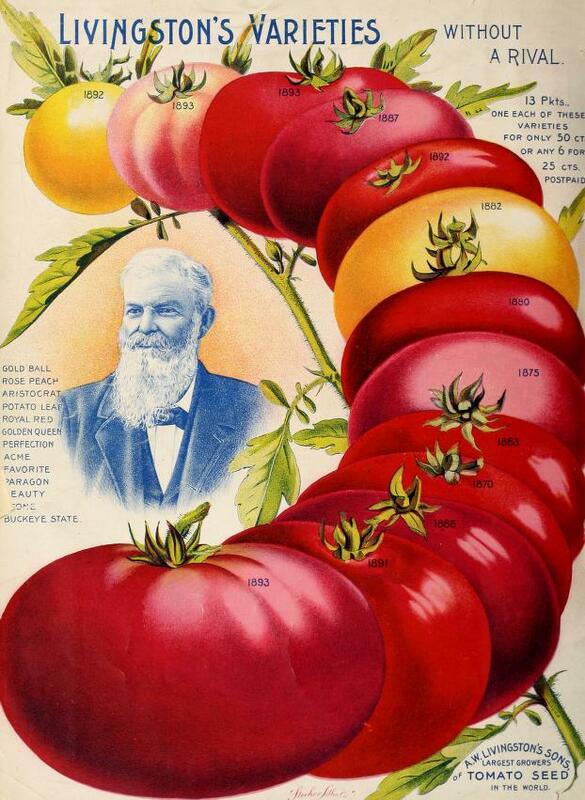 Livingston and his seed company eventually introduced more than 30 varieties of tomatoes. By 1910, half the major varieties of tomatoes grown in the United States were Livingston products, and he won praise from the U. S. Department of Agriculture. -- The Yearbook of Agriculture 1937, U. S. Department of Agriculture. Stone and Globe are among the Livingston varieties grown today. Seed producers still carry heirloom Livingston seeds such as Acme, Beauty, Buckeye State, Dwarf Stone, Golden Queen, and Perfection. Tomatoes grew throughout the world long before Livingston’s work. The tomato is native to the Americas, where the ancient Aztecs and Incas grew it more than 1,300 years ago. In the 16th Century, Spanish Conquistadors took seeds back to Europe from Mexico and Central America. People in Spain, Italy, and other Mediterranean countries fell in love with it. The French thought tomatoes had special powers and called them "The Apple of Love." But the British believed tomatoes were poisonous, and the American colonists carried that myth with them to the New World. Gradually, however, tomato fans emerged, including the Creoles in New Orleans who diced up tomatoes for jambalayas and gumbos. Livingston selected and planted seeds from tomato plants that bore good fruit. Then he gathered seeds from the best of those tomatoes. Gradually, he got tomatoes that were bigger, smoother, and meatier. After 5 years of this careful selection process, Livingston was ready with seed for a tomato he named the Paragon. Born in 1821 in Reynoldsburg, Livingston eventually moved to Columbus where he started the A.W. Livingston's Sons seed company. Today, life without Lycopersicon esculentum would be odd, indeed. Imagine spaghetti with no sauce, pizza with no rich red topping, and salsa would be lost without it. Livingston and the Tomato by A.W. Livingston (forward by Andrew F. Smith). First published in 1893, this classic is packed with information about the tomato varieties he developed. As a bonus, there are 60 tomato-based recipes, including exotic but delicious items like tomato butter, pie, and custard. The Tomato as Movie Star - Tomatoes are among the few plants that have starred in the movies. The 1977 sci-fi flick "Attack of the Killer Tomatoes" has become a classic of the low-budget so-bad-it's-good genre. The flick features thousands of ordinary tomatoes that morph into savage predators. As if that wasn't enough, the movie was the first of a series that included titles like "Return of the Killer Tomatoes" and the "Killer Tomatoes Strike Back." Top Tomatoes - The United States tops the world in tomato production, followed by China, Turkey, Italy and India. Florida, California, and Georgia are the top tomato producing states in the U.S., each with more than 200 square miles under cultivation. The average person in the United States eats about 20 pounds of tomatoes each year. Healthy Food - Tomatoes are rich in lycopene, the pigment that makes them red. Lycopene is an antioxidant similar to beta-carotene, and wards off the damaging effects of oxidants formed naturally in the body. Studies show that people who eat tomatoes and tomato products regularly have a lower risk of cancer and other diseases. Modern Alexander Livingstons are trying to breed high-lycopene tomatoes brimming with the antioxidant. Home Garden Star - Tomatoes may be the single most popular backyard garden crop, a staple in an estimated 40 million gardens in the United States. Go Ahead, Do the Math - Alexander Livingston sold 5,000 pounds of seed for his delicious "Beauty" tomato in 1893. How many tomato plants would that grow? Hint: One ounce of seed contains about 340 seeds. Assume a 95 per cent germination rate. Go ahead, do the math. A Grain of Truth - Like many myths, the old idea that tomatoes are poisonous did have a basis in fact. Tomatoes are members of a plant group, the Solanaceae family, which includes poisonous members. Among them are highly toxic plants like henbane, mandrake, and nightshade. Tobacco, potatoes, and peppers are also members of the Solanaceae family.